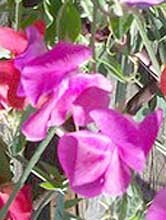 The Sweet pea is an attractive highly scented annual flower which once fully grown provides the gardener with masses of cut flowers for at least six weeks in early August each year. Sweet peas have numerous colours including red, blue, lavender, pink and white and can also be streaked or bicoloured. There are two main types of sweet pea, the taller varieties which can grow to about two metres in height and then the bedding varieties which grow to about knee height. The taller varieties need a trellis or some support as they cannot support their own weight without help. The bedding variety is a smaller bushy plant which is able to support its own weight . Where to plant sweet peas. Sweet peas love a warm sunny spot. The bedding varieties or smaller bushy plants should be planted in beds which are either north or east facing. This allows the plant to get the maximum amount of sun each day and the plant will reward you with strong healthy flowers. The taller varieties of sweet peas should be planted in rows which run from north to south to ensure that both sides of the plant get sufficient sun. Failure to do this will result in the plant flowering more on the sun side than on the side where there is shade. Most sweet pea growers agree that trenching is the way to plant your sweet peas. To do this prepare a trench the length of the bed you are going to plant your sweet peas in. The trench should be about 60 centimetres wide. Remove the top 30 centimetres of soil in the trench and put it to one side. Take a garden fork and loosen up the soil left in the trench to a depth of 30 centimetres. Once you have done this mix the removed soil with a generous amount of compost and 200 grams of bone meal or super phosphate to a square metre of soil. Once the top soil has been properly mixed together place it back in the trench and level it out. You should now have an aerated soil with proper drainage ready to plant your sweet pea seeds in. Planting your sweet pea seeds. It's time to plant your sweet pea seeds. If you are planting the taller varieties of sweet peas place your trellis work close to where you intend planting your seeds. This will allow the tendrils sent out by the sweet pea latch onto the trellis for support and save you having to tie them up later if the sweet peas cannot find their own support. The bushy varieties do not need support so it is not necessary to have a supporting trellis for them. 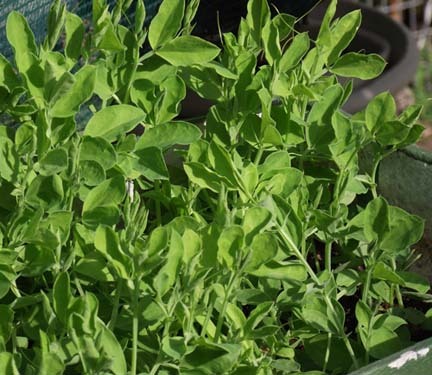 For both varieties of sweet pea you should plant the seed at a depth of about 2 centimetres and about 10 centimetres apart. Doing this will allow each sweet pea plant grow to its full size and enable it to give you the maximum number of blooms. If the plants are too close they use their energies fighting each other instead of producing flowers. Sweet peas don't want to have wet soil to grow in hence the reason for soil that drains well. Keep the trenches moist for the best possible results. If you have mice in your garden chances are that they will dig up your seeds and eat them during the germination period. Birds will also eat your seed so protect your beds from them while the seeds are germinating. Slugs and snails will also attack your germinating seeds so plant a companion plant such as marigolds close by to attract them away from your sweet peas. You can also protect your plants by placing crushed eggs shells around the base of each plant. Aphids can cause viruses such as the mosaic virus. The viruses cause plants not to grow properly and the flowers and leaves to be speckled. If you discover this virus in your garden it is best to destroy the affected plants to prevent the disease from spreading. Better still get some ladybirds into your garden to eat the aphids before they can cause any damage. Red spider mites love sweet peas. To keep them at bay spray your sweet peas with water every day and dust them with sulphur every few weeks. In places where you are likely to have very cold spells in the weather you might experience a problem where buds form, turn yellow and then drop off. There is nothing you can do about it other than to protect your plants from the cold which is nigh impossible. The next best bet is to find a sweet pea variety that is not affected by cold weather. In some instances your plants might be affected by a condition called leaf scorch. This is where leaves at the bottom of the plant start drying out and falling off. This condition moves up the plant until all its leaves have dried out and fallen off. While there are still leaves on the plant your plant will flower. Once all the leaves have gone the plant will no longer flower and most probably die..
Pollen beetles can also be a problem. These black beetles are attracted by the light coloured flowers and will congregate on the flowers in large numbers. There is no remedy for them other than to pick the flowers and place them in a vase in a dark room with a light on in a corner away from the flowers. The light will attract the beetles who will then abandon the flowers. If you have any of the above problems and want to use chemical methods visit your closest garden centre for advice on what to use. Set out above is the organic way to deal with plants pests.